Lady Gaga, a quintessential modern pop star, with 42 million Twitter followers, or “little Monsters” as she refers to them, has to be one of the most iconic females of the 21st century. There’s not too much that this amazing lady hasn’t done, from tea with Mr Fry at the Lanesborough Hotel to duetting with Tony Bennett for their 2014 album “cheek to cheek”. Being thought of as the “Illuminate puppet” to promising to keep her clothes on for the Super Bowl! These are just a few things alongside being a multi award winner, from the Grammys to fashion awards to the Golden globe awards, there’s not much that Lady Gaga hasn’t managed to accomplish in her relatively new superstardom. Known for being more than a little freaky and controversial, remember the dress made from meat? From outrageous wigs, over-the-top concert spectaculars, admissions of emotional and narcotic weakness this is one lady you can’t forget and here we take a look at some of her most memorable fashion statements. 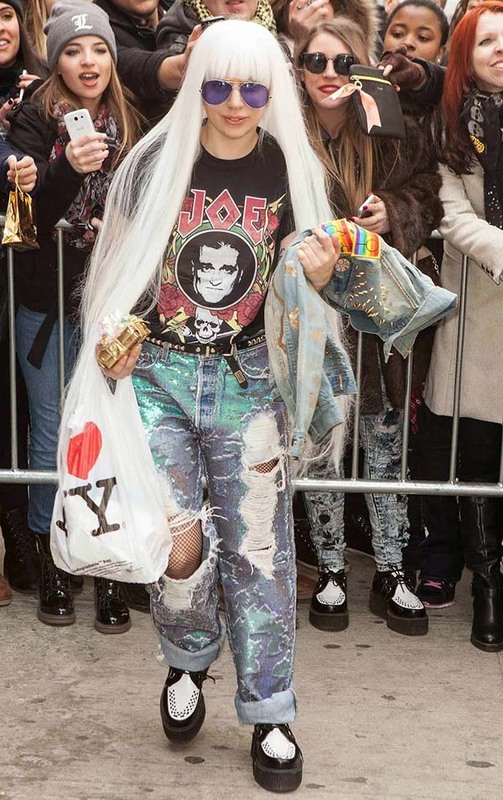 Lady Gaga is crazy for oversized bags! Gaga has the biggest Chanel Cerf Tote we’ve ever seen. Another oversized designer bag was the Orange Hermes Birkin, so big her bodyguard had to carry it for her. But right back at the start of her career when “Just Dance” was everywhere, she favoured the now-discontinued Yves Saint Laurent Easy Tote. As Lady Gaga rose to fame and became a fashion darling, it wasn’t long before designers were thrusting their designer bags upon her. She made a big entrance by arriving late to a Marc Jacobs’ show, while carrying a Marc Jacobs Thrash Clutch. This punky style bag sat well with Gaga’s punk vibe. The punk style was soon ditched and Lady Gaga became a lady, here she is dressed head to toe in houndstooth by Salvatore Ferragamo, even the Salvatore Ferragamo Houndstooth Clutch matches. Chanel featured heavily in Gaga’s wardrobe shortly after, from a custom-made Chanel Camellia Evening Bag that the brand provided for the launch of her Barneys pop-up shop to the oversized Chanel Cerf Tote we mentioned earlier. But there’s more…..she’s definitely a Chanel fan and was seen proudly with a Chanel Mademoiselle Bag several times and also the Chanel Mini Flap Bag, which worked perfectly for the two weeks that Gaga only wore black and gold. But no celebrity Chanel collection would be complete without the Chanel Classic Flap Bag in black. Hermes bags have also featured heavily a lot throughout the years, customized of course. The first most notable Hermes occasion was when Gaga had a Japanese message to her fans written in Sharpie on the visage of her white Hermes Birkin. But who could forget the DIY studded Hermes Birkin! Controversial, publicity seeking or simply part of Gaga’s crazy world but that had to have been enough to ensure the blood to boil of any Hermes fan. Having ditched the bags of late and more recently seen out and about with a teacup, yes that’s right a teacup, who knows which designer she’ll be favouring next. As with all Lady Gaga’s outfits we simply can’t wait to see. Next Post:The Chloe Drew And Chloe Faye Bags ,Who’s Wearing Them The Best?